Selecting the right hotel is one of the most important decisions to make when planning a vacation. Book wrong and you could wind up overspending, staying in a sketchy part of town, or feeling overtired and just plain blah throughout your hard-earned vacay. If you choose the best hotel for your family vacation, however, you’ll ensure a relaxing trip for all. These 10 factors will help you narrow down options to find the ideal place to stay. This post brought to you in partnership with Embassy Suites. Similar to the old adage for restaurant success, picking the right location for your holiday can mean the difference between an enjoyable or miserable hotel stay. Do you want to be near the beach, or in the heart of the city? Or maybe you prefer the tranquility of the suburbs. Transportation is a factor, too. If you want to save money on renting a car, be sure to choose a hotel within walking distance of attractions or close to reliable public transportation. Call your hotel in advance to see if they offer a shuttle from the airport or to nearby sites, and whether a fee is charged for the service. After a long travel day it sure is nice to have an on-site restaurant or two at your hotel. An in-room fridge, coffee maker and microwave make snacks and quick bites easier, too. And what kid (or grown-up!) doesn’t get a little thrill out of ordering room service to be delivered straight to the room? Embassy Suites takes it up a notch by offering complimentary evening receptions with snacks and drinks for adults and kids alike (including beer, wine, cocktails and mocktails). Fresh flowers, attractive art, and thoughtful interior design add to the vacation experience. Even if you’re on a tight budget, you want to sleep somewhere comfortable, clean and inviting. The signature inner atriums at Embassy Suites hotels encourage guests to kick up their feet and relax a while with their plants, fountains and sometimes even koi ponds (or a roaring animatronic lion!). Want a little me-time or couple-time during your family vacation? Many hotels and resorts offer on-site kids clubs. Beware, however, that this extra perk usually comes with a hefty price tag in terms of a resort fee and/or hourly charge. 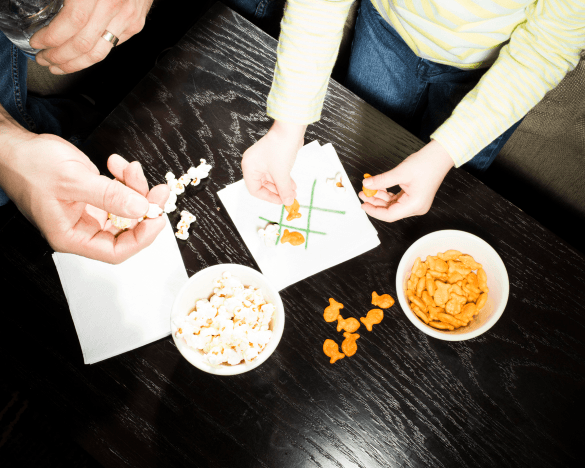 Even if there is no on-site childcare facility, most hotels are happy to provide a list of local babysitting agencies. Or, you can check out online babysitter services like Care.com. Whenever searching for a hotel, be sure to factor freebies like included breakfast in the cost. Dining out each morning can add up quickly, both in time and money spent. 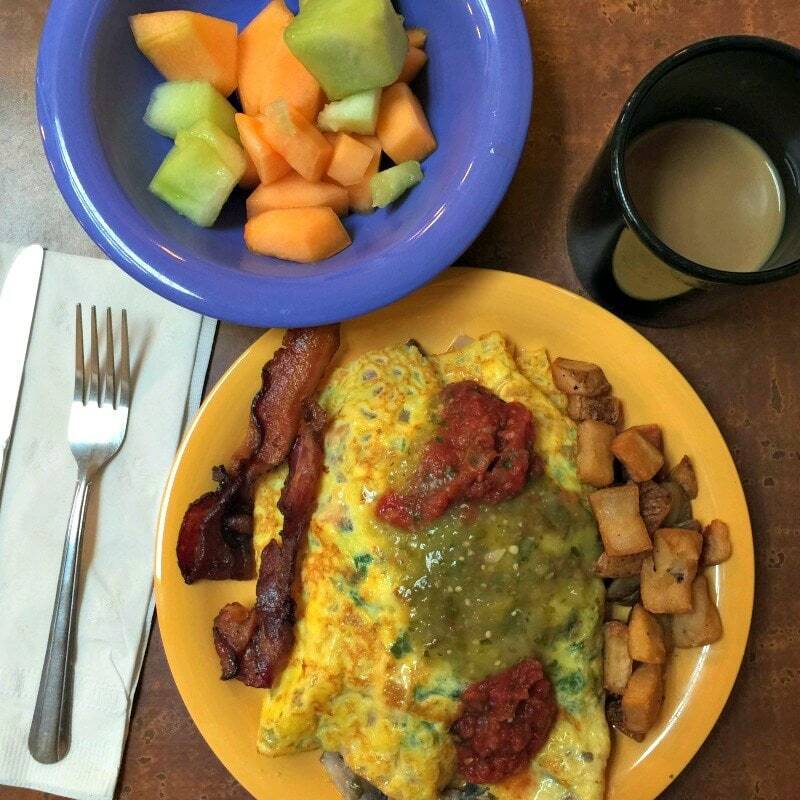 Cooked-to-order morning meals at Embassy Suites make a convenient and tasty way to start any vacation day. Paying for WiFi at a hotel is a pet peeve for many travelers. Thankfully hotels are catching on and providing Internet service at no extra charge. This makes staying connected while away easy and affordable. 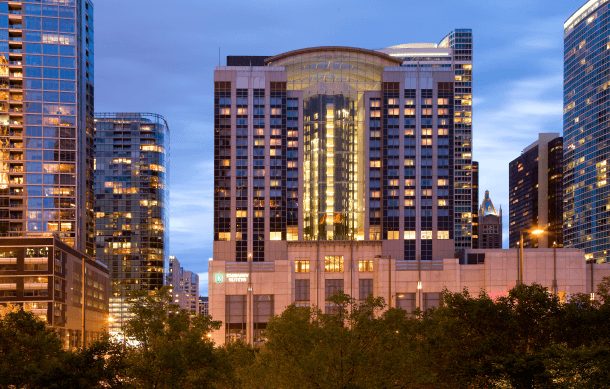 At Embassy Suites all Hilton Hhonors members get free WiFi; it’s free to sign up and you start accruing points toward comped and discounted hotel stays right away. The clincher when choosing a hotel for many families is often the pool. Indoor? Outdoor? My family loves them all! Throw in a waterfall or splash area and we’re in heaven. If you love hotel pools too, you should check out this list of 10 spectacular swimming pools. I always recommend springing for extra space when traveling with children. Booking a suite or connecting rooms gives parents privacy for a little vacation romance and ensures better sleep for all. Be sure your suite is a TRUE suite with two separate rooms, though, and not just a larger or fancier room. 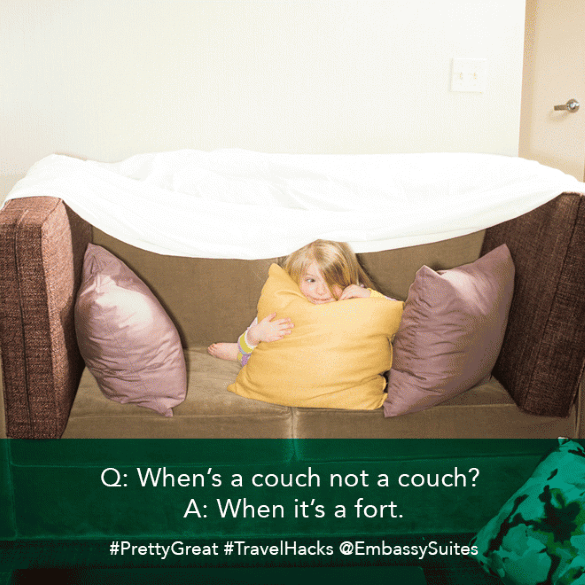 At Embassy Suites, every room is a two-room suite with a door between them. Little extra details at hotels make vacationers feel more at home. 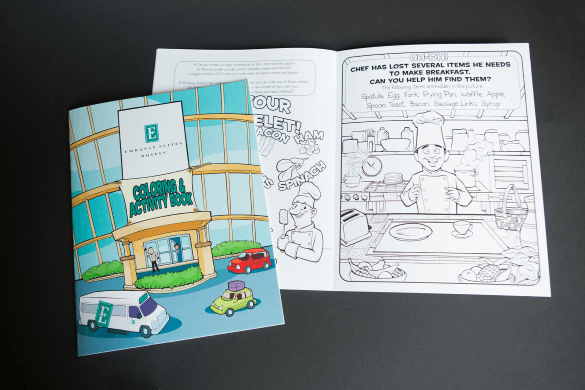 At Embassy Suites, this means welcome gifts for children, family-centric “Do Not Disturb” signs and tic-tac-toe or hangman napkins to encourage family playtime at evening receptions. Of course, price is one of the biggest factors when choosing the best hotel for your family vacation. No matter your budget, you need to weigh the pros and cons of every item on your dream hotel wish list and determine whether the extras are worth the extra cost. Sometimes you may want to splurge on that fancy, high-end resort. 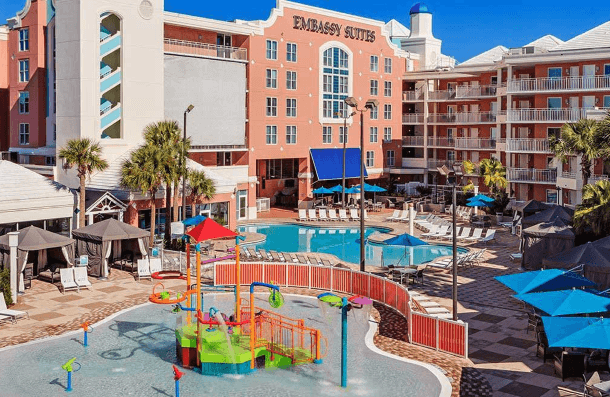 But if you want a lot of included amenities with at an affordable price, Embassy Suites can’t be beat. As you can tell, I love Embassy Suites. In fact, I love them so much that I have partnered with them as an ambassador for their brand and their #PrettyGreat Travel Hacks program. Go check out the #PrettyGreat Family Travel Hacks website for all sorts of travel tips that make traveling with kids easier and more fun! What do you think is the most important factor when choosing the best hotel for your family vacation? Let us know in the comments below! A Note from The Travel Mama: I received compensation related to this post. All opinions are mine, as always. All of these tips are precisely on point. 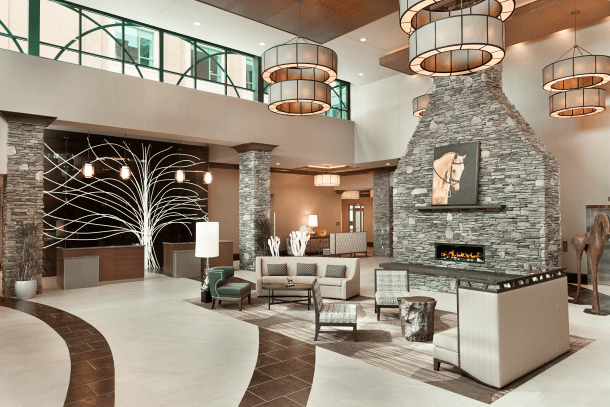 The Embassy Suites in Saratoga Springs is gorgeous, but as much as I can picture my wife and I there alone, knowing that we need to find a space that suits our family makes it harder to pick exactly the right place, and sumptious furnishings don’t always work the best with small children and I’m glad this post recognizes that. Great tips! Your #8 rec is exactly why we stay at Embassy Suites. It’s so nice to put the kids to bed and relax in a separate room without the worry of waking them up. And I love to get my Hilton points! Thanks for the great post Coleen! 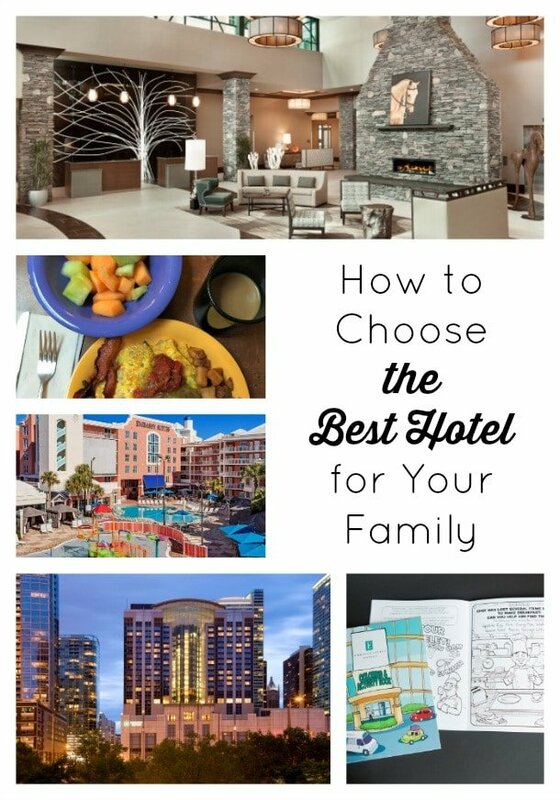 After reading this article I have learned how to choose the best hotel for my family. Out of the 10 tips that you gave, I think that the most important one was the last one, which was Price. I like how you said that you need to weigh the pros and cons of every item on your dream hotel wish list and determine whether the extras are worth the extra cost. I think that is a good point because sometimes you will never use the extras that you are paying for so thanks for that little tip! Steele – So glad you found these tips helpful! Thanks for commenting! Finding the right hotel is so important, especially for a family on vacation. I like to cook, but looking at the on-site dining options is a great tip and can make a hotel even better. You are right about the pool too, my kids always want a big fancy pool at the hotel. Silas – Thank you for your comment! I like to cook, but usually stick to restaurants when traveling. A good pool, though, is a must in most destinations! My husband and I are going on vacation and are trying to find a good hotel. Thanks for the idea of making sure that the place yu pick has free WFi and a complimentary breakfast. I’ll have to make sure that the hotels we stay at have these options available. Sarah – Glad you found these tips handy! Be sure to ask about resort fees and parking fees, too. Those extra hidden costs can really add up! I thought that you made a good point for booking a hotel suite or connecting rooms when traveling with family. That seems like a great way to make a vacation more enjoyable. I can see how both kids and parents would need some space to get the sleep they need to enjoy their vacation, so that’s something I should consider when taking my kids on a trip this summer. Thanks for the tips! Judy – Thanks for your comment! I am not a great sleeper so I always try to book a suite or connecting rooms. Everyone’s happier when Mom has had a good night’s sleep. Enjoy your summer travels! These are some great tips for finding the perfect accommodations during a vacation. When it was just my wife and me going, it was easy to find a place! However, now we need to take our kids into consideration, so thanks for this. I like the idea of finding one that has an on-site kid’s club. My family loves kids clubs! Although, now that my daughter is a tween, she is less keen on them. Thanks for your comment! I agree that when it comes to choosing a hotel you need to choose one that is at a convenient location. I can see how doing this can help you save money on transportation and allow you to tour the place better. It is important to remember to choose a hotel that is reputable and clean. I am looking to start traveling more frequently, and I want to make sure I am finding the best hotels. It’s important that a hotel has the amenities that you are looking for at a price that will fit your budget. As you mentioned, especially with families, it’s great to look for hotels that include extra details specifically for children or families. Thank you for your comment, Annika. Best wishes in finding the right hotel for your family!